This fragrant, delicious and healthful beef soup recipe makes a meal in a bowl that cooks in minutes. Boiling stock is poured over paper-thin slices of raw beef in each serving bowl, instantly cooking the beef in this delicious Vietnamese Beef Soup. In large saucepan over high heat, combine stock, shallots, ginger root, Chinese 5 spices and cloves; bring to boil. Reduce heat to medium; simmer covered for 30 minutes. Remove and discard cloves. Meanwhile use cleaver or large knife to slice beef across the grain on diagonal into paper-thin slices 2 inches (5 cm) long. Place slices on a plate, cover tightly and refrigerate. Soak noodles in hot water for 15 minutes; drain and set aside. Add soaked noodles, oyster sauce and pepper to stock; bring to boil for 3 minutes. 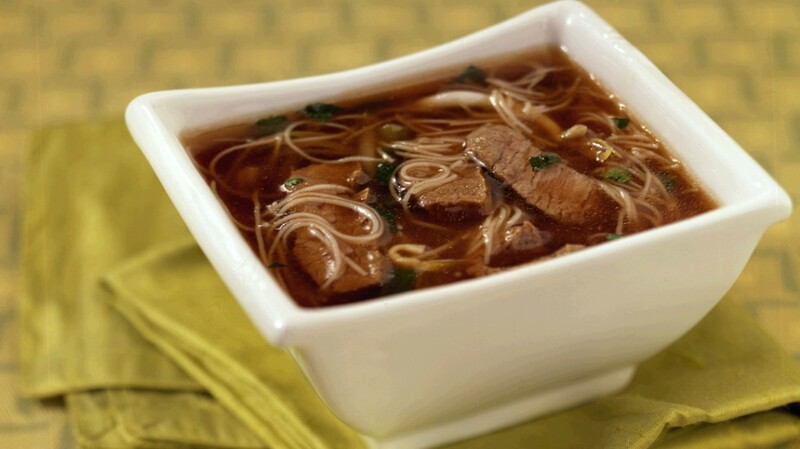 Divide beef slices, bean sprouts and green onions equally among 4 large soup bowls. Carefully ladle some of the boiling hot stock into each bowl to cook the beef. Serve with lime wedges, basil, cilantro and red or green chilies as condiments, if desired.